Last year I was looking around Louisville for areas of unrealized potential. I dutifully followed Broken Sidewalk for development announcements. I kept up with all of the local economic development and planning offices for larger scale plans. While sitting on the Louisville wharf looking across the river, I recalled how the then mayor of Jeffersonville regarded the Louisville skyline as an asset for Southern Indiana. I wondered why there was only one residential tower facing back at Louisville. The clock of the former Colgate factory was the only remarkable feature on the Southern Indiana skyline, though not necessarily the most prominent. I dug a little further. On more than one occasion, I actually crossed the Ohio River. I spoke with staff with the Cities of Clarksville and Jeffersonville. I did a little more research on the Bridges Project. Being in the space I was able to appreciate what the area was used for and where priorities were placed over the years. It wasn’t until I measured the distance from Downtown Louisville to the Colgate Factory that I was ready to put pen to paper. It is closer to Downtown than are the Highlands. It could be anything. The following is adapted from a presented at Pecha Kucha Night Louisville No. 5 in the fall of 2011. For the purposes of this presentation I will use examples found in Southern Indiana. In this report, I will talk about what I see in this area. In all map views—the Ohio River is at the Bottom of the image; the diagonal line is Interstate 65. I started this investigation through a familiar technique of looking for the landmarks that are characteristic of the study area. I have identified some of the places, streets, and districts that we might recognize in Clarksville or Jeffersonville. These landmarks are all within two miles of Downtown Louisville. The familiar technique, terms, and graphics are those developed by Kevin Lynch. What I take from Lynch is his way of capturing many themes having to do with urban design, over a large area, in a series of simple maps. His maps recognize a pattern (District) and identify when that pattern ends (Edges). Lynch found different characteristics, both positive and negative, in streets (Paths) and identified when something in the pattern stands out (Landmarks). I find that those methods quickly inventory and filter information useful in large area planning. When I looked for paths and districts I perceived a significant boundary—both municipal and physical—that separated the Jeffersonville community from the Clarksville community. What we use to travel through Southern Indiana creates a hard edge between both places. Natural connections between Clarksville and Jeffersonville and the river have been interrupted by Interstate 65. The interstate ramps are disorienting. I then looked for planning studies that might take advantage of some of the existing landmarks, address some of the boundary and aesthetic concerns, and otherwise develop Southern Indiana. 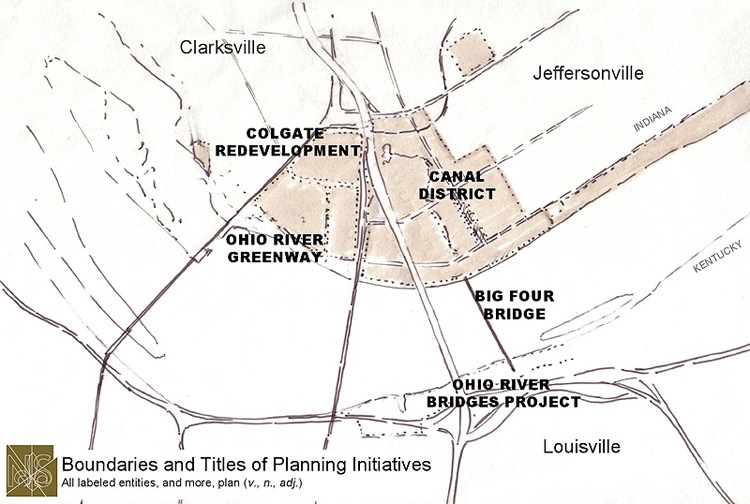 Some of the major plans currently under way include the Ohio River Bridges Project, the Big Four Bridge, the Ohio River Greenway, Jeffersonville’s Canal, and Colgate Plan redevelopment. 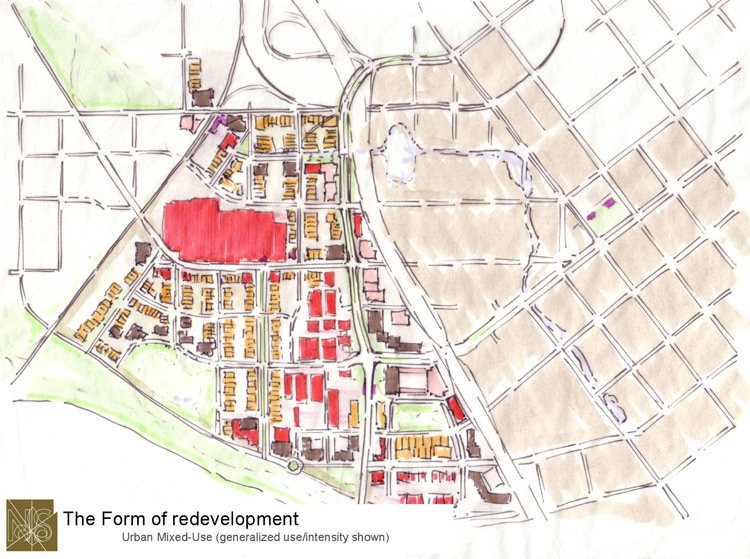 Each planning study addresses the problem that it was assigned. The Canal Project, after solving the stormwater issue, solves the problem of generating interest in Jeffersonville. The Canal doesn’t focus enough on growing or sustaining a neighborhood. It is proposed to have more places to park a car than to live or work. Though it appears now, with the change in administration, that neither the shops nor the canal will be built. The Colgate Factory is a great structure that is planned for redevelopment. Unfortunately, it is isolated from other centers of activity and redevelopment. This close up shows the transportation network after the Canal and Bridges Plans are implemented. At least, so far as I can tell, this is what it would look like. These are your options for your work, home, and shopping sorts of trips. Southern Indiana is dominated by the I-65 axis. Clarksville has few paths through the formerly industrial areas by the river side. 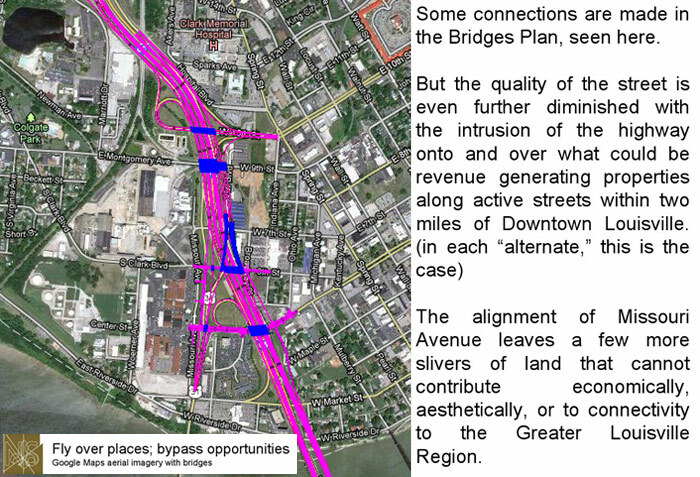 Jeffersonville would have fewer paths if the Canal and Bridges Plans are constructed. I see more connections as part of the transportation, development, and urban design solution. More connections with the ability to carry trips made by numerous modes. More connections to define the spaces that we have to build buildings. 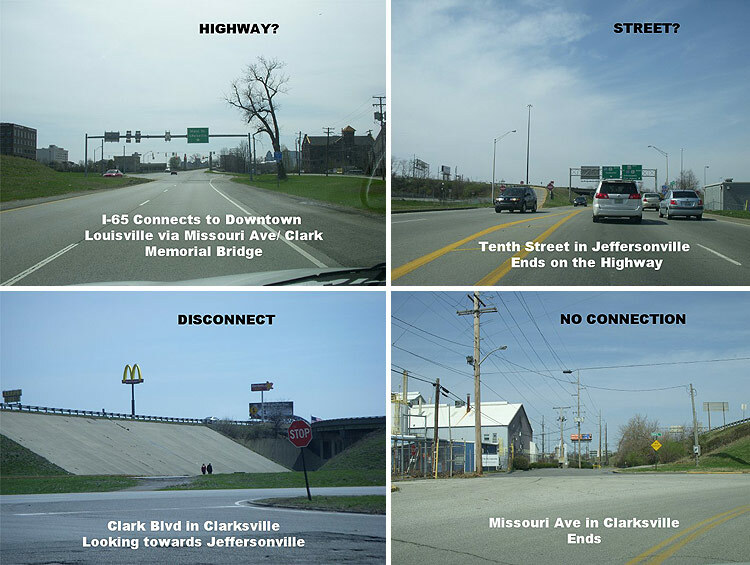 To consider the quality and adaptability of the connection, here are several examples from Clarksville and Jeffersonville. As a driver, what information–what queues–do these thoroughfares give you as to speed, destination, and expectation? If you thought these were urban streets, as I can’t help to, you would have been wrong. Every time I was on Tenth Street headed southwest, I expected it to continue on as a street. The abrupt transition to on ramp caught me off guard. That to me would be a natural connection between Clarksville and Jeffersonville. Both would benefit by opening up new opportunities in real estate and redundancy in transportation. The decisions made to connect Indianapolis to Louisville have isolated parts of Southern Indiana. There are places to eat on the other side of Interstate 65 from Colgate. The pedestrians in the picture in the lower-left are braving their way towards this destination. The image in the lower left was a fortunate observation. I am not certain why any two people would attempt to make this crossing. This clearly illustrates the impediment created by filling the height of the interstate to the ground or building long, unregulated streets not meant to be crossed. Why would a road not go through? What is a highway connection in the top-right picture lines up with a street that dead ends in the picture below it. I think that making this connection and others like it is a challenge worth undertaking. Our streets create a framework from which we build our cities. The Bridges Plan would have us flyover Southern Indiana and continue on through the area despite whatever is happening on the lower level. Businesses do not connect to the flyover ramp. You cannot get a cup of coffee 40 feet above Court Avenue. If you wanted to stop, how would know where to? Or how to? For several miles north of Tenth Street, I-65 is flanked by access roads. These are neither pure ramps or pure streets. They certainly are not places where businesses open on to. But why not? It could be more surface area for businesses to grow. Instead of the disorienting points of entry on creeping interchanges and climbing flyover ramps, I propose a loop between the southern-most two Southern Indiana exits that would allow mobility options for traffic to move around and into the surrounding street network. Priority would be given to traffic that moves on this loop in the morning and evening. So that the loop can provide some redundancy to the highway above but still be a vibrant, revenue generating street, during most other hours of the day, most other days of the year – specific design and access requirements must be adopted. 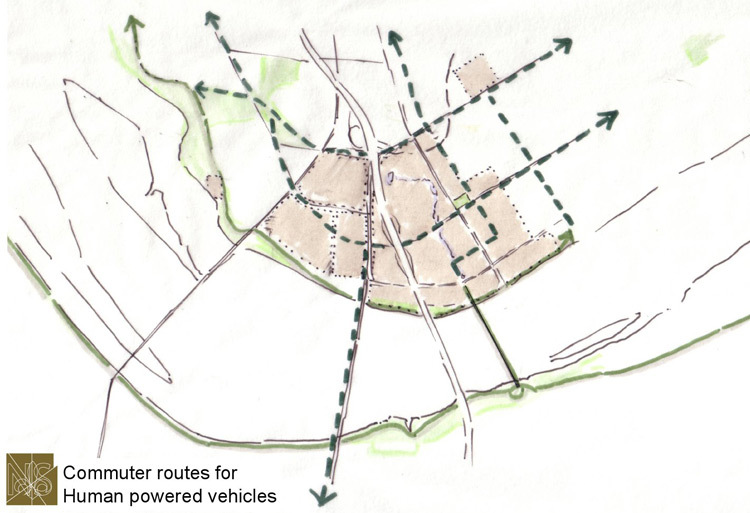 These are the roads that I think will have to specifically accommodate bicycle commuters, in addition to cars. Most bicyclists should be able to ride with traffic on the other routes. Shown here, are the most direct routes to and from Downtown Louisville. These roads are primarily for vehicles today. These are the roads that would need additional treatments before introducing bicycle commuters. This is what I imagine to be the appropriate building massing where the Second Street bridge ends near the Interstate 65 interchange. In my regional mental map, I see the corner of Missouri and Court in Jeffersonville rivaling the corner of State and Main in New Albany. Here, we reveal the rest of the street alignment, building massing, and land use concept plan for the area. The key to this plan is Re-Imagine-ing the Colgate Plant and redeveloping the Marathon Oil site. 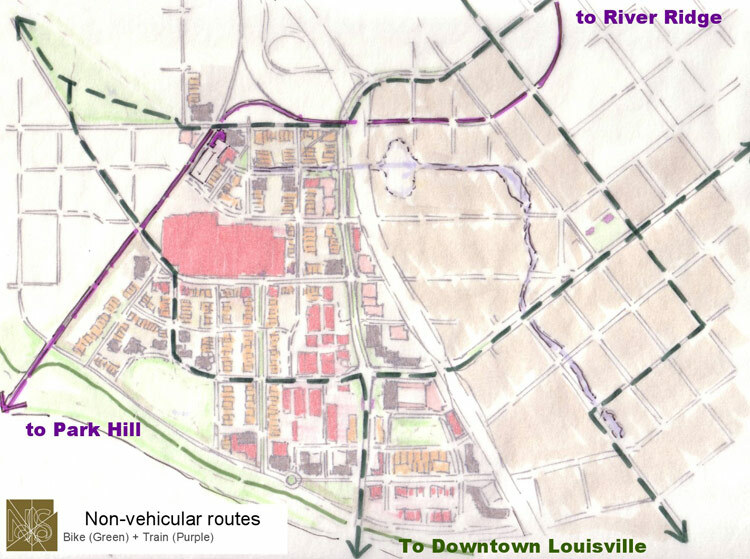 This new, Urban neighborhood is strengthened by improved connections to Louisville and to Jeffersonville. This is the non-vehicular transportation plan. Commuter Bike lanes are shown in dashed green lines. Commuter Rail in Purple. I imagine a Train Stop on the Colgate site, where those lines converge in the top-left part of the image. (This is a suggested location for a stop. If commuter rail is ever introduced, this intersection should be developed around transit.) 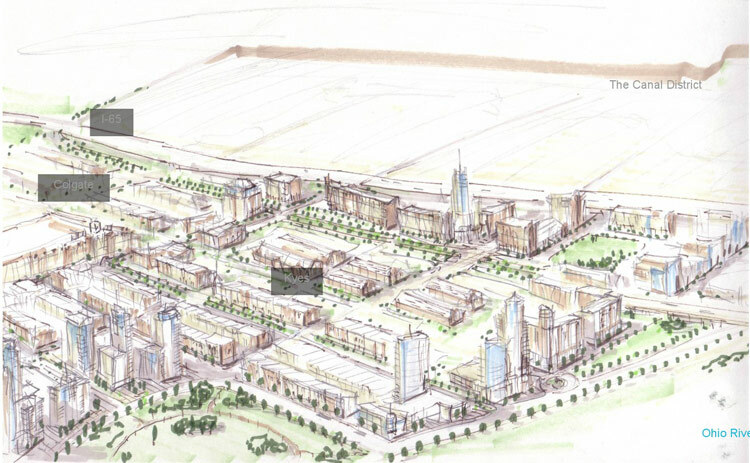 This would truly connect Louisville and Southern Indiana neighborhoods, business districts, and industrial parks. This is the future most famous intersection in Southern Indiana. The ornate tower marks the northeast intersection of Missouri Avenue and Court Avenue. I imagine towers with expansive views of the river and the Louisville skyline, placed amongst townhouse and corner-store concepts, all aligned in an appropriate urban-grid pattern, within two miles of Downtown Louisville. I see opportunity in Southern Indiana. I believe that it looks something like this. The old oil tanks make way for a park. The riverfront is reclaimed by park. The floodwall is disguised by park design and building architecture. Court Avenue finds its way through the old warehouse development that now includes Kyes to the new development. The boulevard of Second Street continues across the river as Missouri Avenue. Clarksville connects with Jeffersonville. Towers and low rises for residences, offices, shops, and hotels create a new identity for Southern Indiana. Maybe a convention hotel and steak house with views of the Louisville skyline establish a brand on Riverside Avenue. People with dogs and iPads make a neighborhood in a place where there is little of it now. It begins with a little regional cooperation and a motivated team to spark and maintain a vision for Southern Indiana. 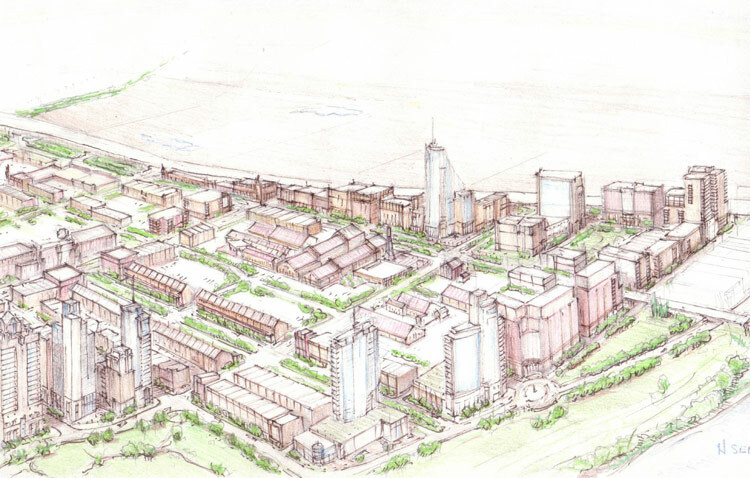 I am working closely with Clarksville and have recently completed a master plan for Clark’s Landing North (i.e. old colgate grounds). The plan has been approved by Town Council to be implemented into the Comprehensive Plan. Much of what has been drawn and discussed in the essay resembles the vision which Clarksville is heading. The street mapping for Clarksville, massing for Clarksville and connections into Jeffersonville are being planned almost exactly as discussed above. Because of politics, owners of properties and environmentally/historically sensitive site this process takes time, as one could imagine. Clarksville is heading in the right direction and change is eminent! Very nice essay and glad to see others are thinking positivity for Southern Indian region. @neal, that is a great comment: Exactly! @Matt, I look forward to seeing what your group is working on. I do hope that this essay is more than just agreeable reading. @Peter and @Lil taz, I do enjoy exploring the region (which I regard as one place) around me through brief exercises such as this. With a little luck, well positioned developers, and some targeted interventions in the urban design of the space, the sunny side of Louisville could be a hip place. Of course, if So In builds out to the level depicted within the the last illustration, I assume that the Louisville skyline would be at least that much larger. @Peter – thanks, @ Lil taz – stay tuned. Look at your big river cities that are separated by states. Cincinnati and Covington/NKY. St. Louis and East St. Louis,(example of what not to do.) But the relationship NKY has with Cincinnati is great there is all kinds of economic development going on because of an agreement that strengthens the whole region. Like the connection of I 275, Newport on the levee, and the business and economic player that Covington has become with the CVG and other businesses moving in. The biggest thing they have going is an educated work force though. Without that you are hard pressed to get the amount of corporate backing you would need to pull off a project of this magnitude. Unless Humana and UPS are going to fund the whole thing. In a perfect world Louisville would have about 10 or 15 fortune 500/1000 companies that would see a shared interest in sparking growth in SI and making it Louisville’s North Side. Btw love this without this type of vision and urban foresight we will either become boring or nothing will happen at all. When can I get a new brick exposed, condo loft in the Colgate building?